Back of card: The four roses (red, blue, gold & white) on grey-blue background. Book included: Yes, 124 pages, 5 x 8.7 inches; or 12.7 x 19.5 cm. Illustrated. Titled, Reveal The Secrets of the Sacred Rose, by Steven Culbert. Publisher: AG Muller. Deck printed in Switzerland. 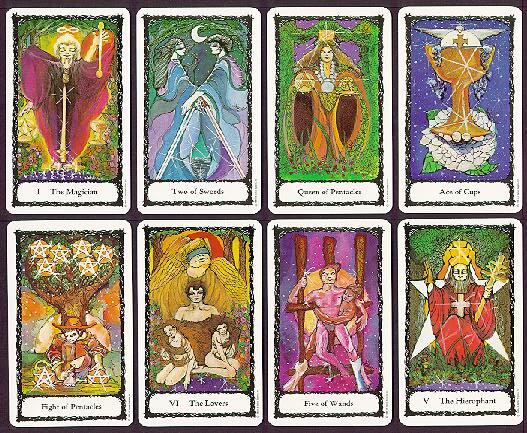 Comments: On the outside of the box it says, "The five mystic roses appearing throughout the Sacred Rose Tarot deck are the Western equivalent to the sacred lotus of the Orient. Red rose stands for sacrifice, white rose is purity, blue rose represents the impossible, gold rose signifies achievement, & the cosmic rose suggests time & space."